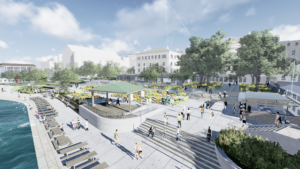 The cherished Wisconsin Union’s Memorial Union will soon be joined together to the Wisconsin Alumni Association’s Alumni Park, which is set to debut Oct. 6, by a permanent seam of sidewalk and greenery. This walkway binds together the fabric of experiences for a lifetime on the historic Terrace and memories to be made at the new park. This seam will mean new opportunities to enjoy the Wisconsin Union’s and the Wisconsin Alumni Association’s (WAA’s) lakefront oases, a combination that is collectively known as the Lakefront Gateway. Don’t fret for a moment; the Memorial Union Terrace isn’t going anywhere, and neither are all of the experiences you look forward to each spring, summer and fall. And this year promises to be better than ever with the Wisconsin Union’s first full season with the renovated Memorial Union Terrace. We’ll still have music, films, art classes, outdoor recreation, brats, ice cream and unforgettable sunsets. But, on Oct. 6, our lakefront paradise will be joined by our neighboring Alumni Park, which replaces a previous cramped parking lot and loading dock. Developed by the WAA, Alumni Park will offer green spaces and gardens, learning experiences through museum-quality outdoor exhibits, and new lakefront events and programs. As a partner in serving the community and as a decades-long neighbor, we at the Wisconsin Union look forward to collaborating with WAA on this new lakefront experience. When Alumni Park is open, the Union and WAA will be joined by not only a seam but also by our dedication to providing the best possible lakefront experience for our community. Learn more about the Lakefront Gateway at uwalumni.com/lakefront-gateway.